Central Arkansas offers so much variety when it comes to youth sports, each varying in levels of intensity, time commitment and cost. Here’s a guide to get your sporty youngster on the field, court, course or mat! Ask any young family what they’re doing on the weekend and chances are you will hear a long list of activities that include youth sports games or tournaments. It just seems to come with the territory. Youth sports aren’t just a cultural phenomenon; they also provide a range of health benefits for young people. But how do you know which is the right sport for your child? Experts say helping kids decide takes time; don’t be surprised if they don’t immediately know what they want to do, and be prepared to try a few things as they figure it out. Kids’ basketball ranges from the very basic Upward program sponsored by local churches to elite AAU programs beginning as early as fifth grade. Look for a program that meets your youngster’s skill level and interest and most importantly, makes an effort to spread out playing time. Basketball equipment doesn’t have to cost much; a ball and a pair of shoes are about all the specialized gear you need. When shopping for a basketball, look for a reasonably priced composite model labeled indoor/outdoor in the appropriate size for your youngster. Most leagues provide a T-shirt, but some require money for full uniforms. Rec league basketball follows the general basketball season, which is during the school year, so weigh time commitment carefully. Penick’s program limits games to one to two per week, plus at least one practice. Another sport that preaches etiquette is golf, a game with a highly refined code of ethics. In addition to the formal rules of golf, young players are schooled in the rules and practices of respect and conduct that easily translate into success in everyday life. Golf used to be very difficult for kids to break into if they came from outside certain socioeconomic groups. Not so anymore; today organizations exist whose entire mission it is to bring golf to as many young people as possible with a special emphasis on underserved populations. First Tee of Central Arkansas and Full Swing Golf Academy are two great local options. Golf can be a very expensive game between equipment, greens fees or club memberships and group or private lessons. It’s also a big time requirement with a round of 9 holes taking about two hours for average players, longer for youngsters who are just learning. And, because most full-sized courses aren’t going to let kids play unattended, the investment affects parents, too. 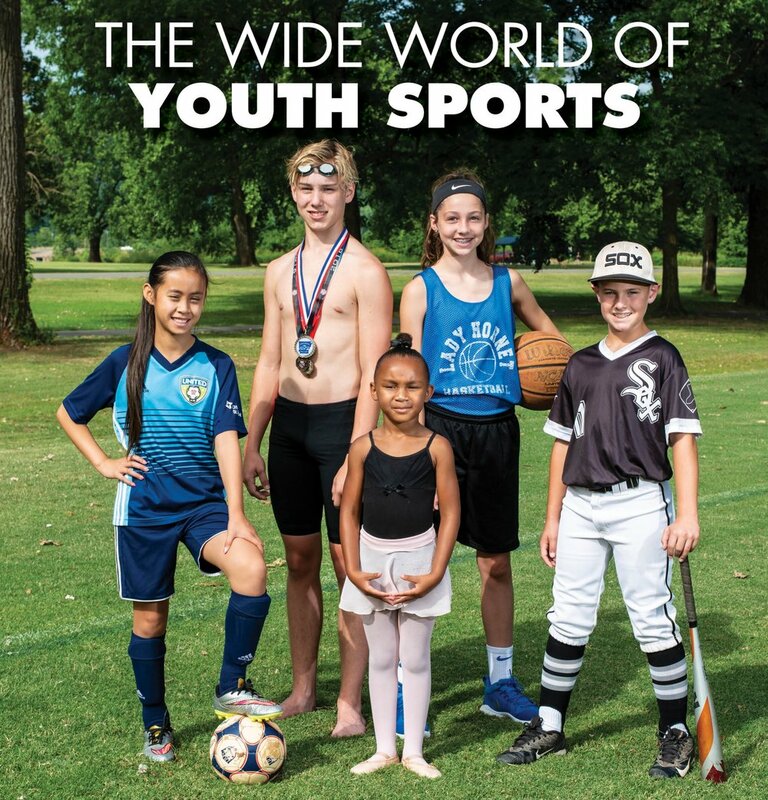 Soccer is one of the most popular youth sports and Little Rock offers a number of options to participate, including Arkansas United Soccer Club. The squad caters to both recreational and competitive players, with the latter demanding a higher time commitment, including traveling to tournaments. A membership fee is standard fare; the higher the level of competition the higher the fees to cover the cost of paid coaches and tournament entries. A uniform may or may not be included in fees across all leagues (it is for Arkansas United); be sure to check the fine print. Equipment gets more expensive the more competitive you are, but for recreational players, these expenses are relatively nominal. Especially at the younger levels, a pair of cleats or tennis shoes, shin guards and a ball can all be had for relatively low cost. If everything you know about martial arts has come from watching Jackie Chan movies on Netflix, you’re missing some of the best benefits of participating in the art forms karate and taekwondo. Martial arts disciplines are made up of individual skills, which students learn and master sequentially. The color of their belt denotes their relative rank in the program. Athletes progress at their own pace but all complete the same requirements to move from one rank to the next. Nicholas estimated it takes three years or more to meet the requirements and obtain a black belt. A lifelong activity that stresses manners and respect as much as kicking and punching technique, martial arts enhances fitness and reduces stress. The cost to participate varies with the school; potential additional costs include the uniform, equipment for weapons training or competition, testing fees and entry fees for tournaments. Gymnastics is a great activity for boys and girls as young as age 2 to increase poise, coordination and balance. When selecting a gymnastics program, do your homework by watching a class and paying particular attention to the teaching style and organization of the instructor. “You want to see if the program has an upper level; if a program knows how to safely train upper-level kids, chances are they know how to safely train your 3-year-old on a cartwheel,” said Jamie Russenberger, owner of Increased Heights Gymnastics. The frequency (and price) of gymnastics classes varies widely from gym to gym and across different levels. Ask about a trial class for your child to test out before you sign up. There’s little special gear to buy and generally gymnasts don’t need a uniform or other garb unless for a competition. Many female gymnasts wear leotards in practice, which can get pricey, but workout clothes are also acceptable at some gyms, especially for beginners. The gymnastics season runs November to March, so balancing schoolwork with meets is key. And, as with other activities, gymnastics gets more expensive and time-consuming the more competitive an athlete becomes. Youth baseball is a cornerstone of sports leagues for kids and is available for virtually all ages and skill levels. One of the best-known in Little Rock is Junior Deputy, which hosts between 800 to 900 players, ages 4 to 15, across various teams and divisions. Depending on the league, baseball requires little more than a glove, bat, ball and cleats to participate. It can be one of the most time-consuming sports at the competitive level given select teams’ travel schedules. But in the beginner divisions, seasons are generally manageable with no travel involved. Junior Deputy starts kids at the tee-ball level, then graduates to coach pitch and finally introduces player pitch. Volunteer coaches are crucial to the program and give parents additional opportunities to participate with their child. A growing sport, and great workout, too, besides is climbing, as evidenced by several climbing centers popping up all over Arkansas. These centers provide ample physical challenge, while at the same time delivering a serious mental workout. Climbing requires a minimum of equipment; clothes that stretch and allow freedom of movement are a must, but not so baggy as to get hung up on holds or in gear. A chalk bag and chalk improve grip by absorbing moisture on the hands. Most climbing centers provide the necessary harness and ropes used during the session. As the activity has gained in popularity, competition has followed. Climbing competitions are straightforward—fastest time to the top wins. Like all the activities on this list, the more advanced your interest and the more competitions you attend, the more registration and practice fees stack up. Like gymnastics, dance is an activity that provides an excellent cardiovascular workout while promoting grace, discipline and poise. Dance programs start very early in many studios, with 3- and 4-year-old classes not uncommon. Many beginner classes cover a variety of dance styles, although it is also possible to pick one genre (ballet, for instance) and stick with it full time. The requirement for beginning dance is generally one class a week for roughly an hour or so, depending on age. Between ballet slippers, tap shoes, practice leotards and extra studio time, dance can get expensive; be sure you understand these costs up front. Dance recitals are generally held to demonstrate what the class has learned as well as to acclimate youngsters to performing in front of people. One feature to ask about is performance opportunities outside the studio. Shuffles, for instance, has been heavily involved with Ballet Arkansas’s annual Nutcracker ballet and that tie-in has afforded many youngsters the chance to participate in the performance. Recreational swim teams abound in Central Arkansas, providing a healthful activity to keep kids occupied during summer break. Not only is swimming one of the few activities on this list that provides a practical skill, it’s also fairly inexpensive, although the racing version swimsuit is considerably more expensive than the garden variety board shorts. CASL member clubs host multiple meets throughout the summer, including a Meet of Champs to close the season in late July. Kids swim to win, but it’s a decidedly more laid-back environment than the competitive leagues such as USA Swimming or AAU that some kids opt for later on. Kent Gartin is race director for the Bryant Kids Triathlon, an event he’s been putting on for years, in which time he’s seen a marked increase both in participation for his meet and throughout Arkansas. “The event that we did this year hosted athletes ages 5 to 15, we even had a couple 4-year-olds doing it,” he said. Triathlon combines cycling, running and swimming into a single race. The biggest expense is the bike, although competitive swimwear and a good pair of running shoes can be expensive as well. Training time is generally not overwhelming at the kid level, especially since many youngsters are doing the three components anyway just by being kids. The time commitment for meets, especially among the younger ages, isn’t high either.